This is part of a series about the new features in Parallels Desktop® 14 for Mac. If you’re upgrading to Parallels Desktop 14 from an earlier version, you’ll save a lot of space. The exact amount depends on a variety of factors, but this blog post will explain all the new features of Parallels Desktop 14 that can potentially save space (compared to earlier versions), and I’ll show you how much space I saved. So the Windows defragmentation algorithm can’t take advantage of the fact that it’s really stored on the Mac disk, and the Mac can’t take advantage of the fact that this big VM file is internally structured as a Windows drive stored on an NTFS-formatted disk. Note: This new Parallels Desktop 14 feature is only for Windows 10 and Windows 8 VMs. The result is that the Windows VM takes less space on your Mac disk. The process shown in the above animation takes place when Windows is running on your Mac—but only when you’re not doing anything else in Windows, so it can take quite a while for you to see the full benefit of this storage optimization. 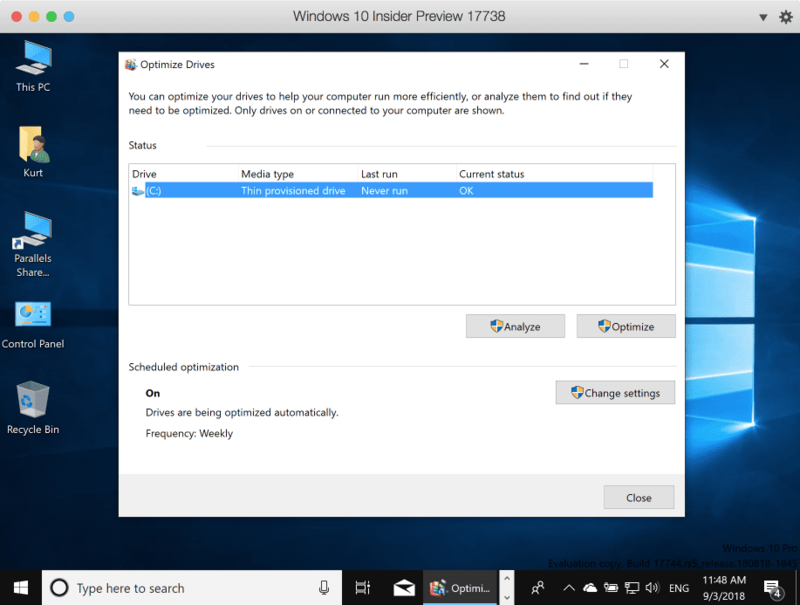 If you’re anxious to see the savings, after you upgrade to Parallels Desktop 14 and install Parallels Tools in the VM, you can manually run the “Defragment and Optimize Drives” utility in Windows. See Figure 1. So how much space will you save? The answer to this question will depend on how many Windows 10 or Windows 8 VMs you have and is unfortunately quite hard to predict for any single VM. Many VMs will be about 2 GB smaller after this optimization takes place; some will be a lot smaller, and some will shrink by a much smaller amount. Here’s what I experienced on my MacBook Pro®, which has one Windows 8 VM and three Windows 10 VMs. I saved almost 25.5 GB on the SSD of my MacBook Pro. Parallels Desktop 14 contains another new update to the “Free Up Disk Space Wizard” to help you effectively manage the storage of all your VMs. This wizard will point out some potential storage savings for each of your VMs. See Video 1 for the results of my use of the Free Up Disk Space wizard on my MacBook Pro. The savings here depend on which pieces of advice you eventually follow. The Parallels Desktop 14 application is about 150 MB smaller than the Version 13 application. Not only will this save you some space, it will also make any Parallels Desktop 14 updates smaller, so they’ll take less time to download. Bundled with Parallels Desktop 14, Parallels Toolbox contains a Clean Drive tool. It will identify files on your Mac that you can consider removing: old backups of your iPhone® or iPad®, log or cache files created by a Mac application, or iTunes® temp files that are no longer needed. 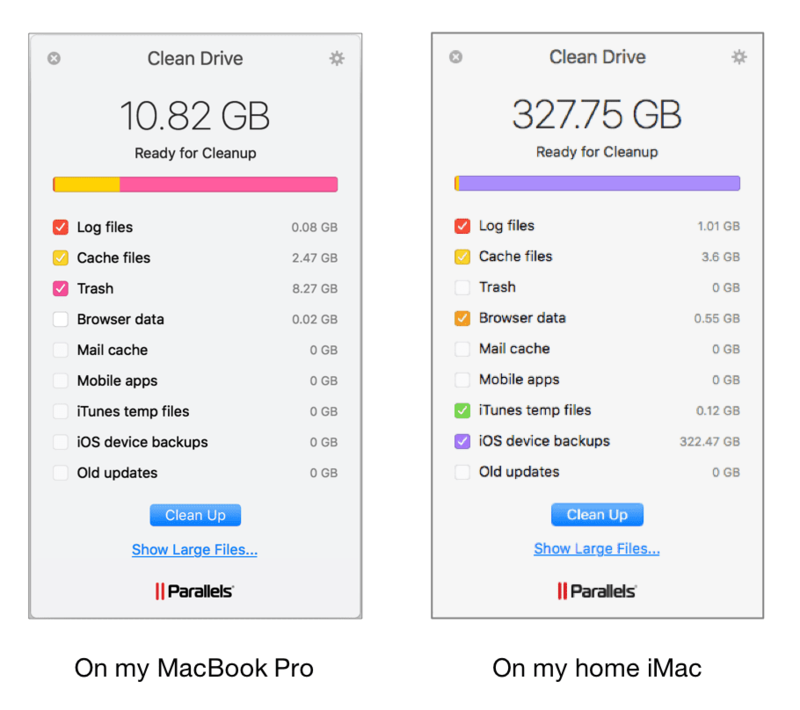 Figure 2 shows the results of the Clean Drive tool for my MacBook Pro and for my iMac® at home. Taken all together, these four space-saving features and tools can recover a significant amount of storage on your Mac. Let us know in the comments how these worked for you and how much Mac storage space you recovered.